I have a passion about traditions and celebrations from different cultures around the world. I was lucky to live in 6 different countries so far and I feel grateful that these experiences enabled me to discover new festivals. I have written on this blog about some that we have adopted into our family like The Chinese Mid-Autumn Festival, Martinmas, Advent, Spring Celebrations in our multicultural family… But there are so many others that I would like to know more about. Dear readers of Mothers Abroad! I am Asumi, living in Tokyo, Japan, with my husband and 4-years-old daughter. I am passionate about seeing the world through the eyes of a child, giving children the dignity that they deserve, and stepping closer to a world in which the candles of hope inside all children can continue to shine. Asumi, what does Setsubun symbolize and what does it mean for your family? Setsubun has been celebrated in Japan for thousands of years, on February 3rd, as a way to commemorate the end of winter (daikan) and the coming of spring (risshun). Though the days are still very cold with snow days ahead of us, it is a special time during which the concept of rebirth is celebrated, as nature gradually prepares for spring! For our family, it is a time to connect with our ancestors, our culture, and with nature. We believe that by deeply appreciating the arrival of spring through Setsubun, in ways that have been passed down for generations, we are able to re-awaken our senses, enrich our lives, and take part in building a peaceful world. What values you want to role model and hope to pass on to your children by celebrating this tradition? As a family, we value time together, and Setsubun is a time for us to pause and slow down. Our days always feel busier than we wish, and Setsubun is a time for us to feel grateful for simple things like cooking together and making decorations together. 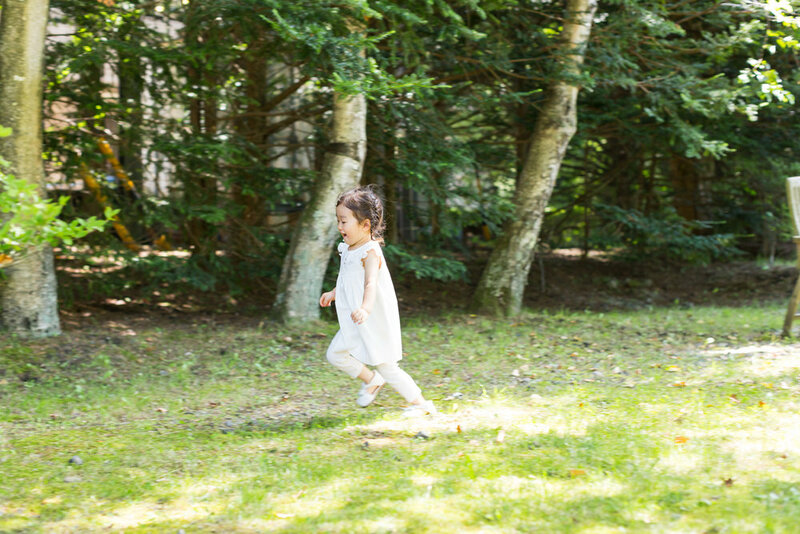 The days leading up to Setsubun are especially important for us, as we try to give our daughter the freedom to be actively involved in all aspects of preparing for the celebration. As with other practical life activities, we believe that this models self-care, builds self-confidence and self-worth. "Joy, feeling one’s own value, being appreciated and loved by others, feeling useful and capable of production are all factors of enormous value for the human soul" - Maria Montessori. How and what do you prepare in advance? Families also often decorate the entrance of their houses with prickly holly leaves and sardine heads because oni demons are known to avoid the sharp thorns of the holly and to detest the smell of sardines. We enjoy making our decorations out of simple paper crafts and origami. We sing songs of Setsubun and enjoy reading folk tales about the arrival spring that have long been orally transmitted within families in Japan. Preparing for Setsubun opens our eyes to the first signs of spring approaching, leading to discussions about the different colors we are starting to see outside and about what is happening underground. Roasted soybeans! Wash one cup of dried soybeans, put them in a large bowl and cover with about 4 inches of water and then soak overnight. The soybeans will double or triple in volume. On a baking sheet, spread the soaked soybeans and bake in the oven (300 Fahrenheit or 150 Celsius) on a slightly oiled baking sheet for about 45 minutes or until golden and crisp. What rituals do you have in your family to celebrate Setsubun? How do you celebrate it? How is your daughter involved? As for our days leading up to Setsubun, every day a we fold an origami otafuku (a simple origami doll with a smiling face that symbolizes happiness) and add to our hanging mobile decoration. During this time or before going to sleep, we talk about the things in springtime we are looking forward to – flower buds, singing birds, spring fruits and vegetables and more … This ritual reminds us that we are on a journey of living in harmony with the beautiful environment surrounding us. On February 3rd, the day of Setsubun, we enjoy mame maki (throwing and eating rosted beans) and then often make an ehomaki Setsubun sushi-roll, a long sushi roll with 7 ingredients of our choice, representing the Japanese seven gods of happiness and good health. ﻿In one of his books the talented Japanese author Kazuo Iwamura describes the way the Mice Family prepares and celebrates the New Lunar Year. My daughter is always curious if this is the way you really celebrate it in Japan :) Do you? We love the story of the Mice Family preparing for the New Year through mochitsuki (making sticky rice cake out of rice). Mochi has a long history in Japan, and since ancient times has been used as an offering to the gods, to express appreciation and pray for a rich harvest in the New Year. We also believe that the spirit of rice in the mochi brings good fortune to those who eat it. Like in the book, it is also a special bonding time as relatives or community members get together for mochitsuki since it is hard work and the more people there are taking part, the better! Our daughter experienced her first mochitsuki when she was just a year old, and has been taking part ever since. We place steamed rice in a large usu (mortar) made of wood or stone and pound the rice using a kine (wooden mallet). Everyone takes turn in pounding the rice until the rice becomes smooth and shiny – changing to mochi. We will eat the fresh mochi with red beans, roasted soybean flour or with soy sauce and seaweed. How do you want your daughter to remember Setsubun when she grows up? I hope she remembers the scent of roasted beans, the laughter, and the excitement of feeling spring approach with each day of snow melting on branches, each new early blooming wild flower appearing on the sidewalk, and the bitter taste of early spring vegetables – all that gives life its magic. I hope that this feeling of spring approaching and the joy of dancing and running with the wind continues to give her a warm feeling inside her heart or years to come. “Let the children be free; encourage them, let them run outside when it is raining; let them remove their shoes when there is a puddle of water; and, when the grass on the meadows is damp with dew, let them run on it and trample on it with their bare feet; let them rest peacefully when a tree invites them to sleep beneath its shade; let them shout and laugh when the sun wakes them in the morning as it wakes every creature that divides its day between waking and sleeping” – Maria Montessori. Hopefully, we will be sharing more about Setsubun and the arrival of spring here in Japan on our Instagram! Thank you, Cristina, for this opportunity to reflect on Setsubun. I look forward to learning more from Mothers Abroad and readers both near and far, on this beautiful journey of walking together with children. Thank you so much Asumi for letting us have a glimpse into your way of celebrating the arrival of spring in Japan. For more pure poetry and beauty, follow Asumi on her page @littlemoments_tokyo. You will need to send her a request first.